Thrifted top// VS pink bandeau//Macys belt// ASOS pants//Boutique9 shoes// Prada sunglasses//Moschino watch//RL, Macys, Saks, eBay, & NY vendor jewelry. Top & purse Random boutique//Macy’s shorts//F21 belt//JS shoes//MK watch//NY vendor, eBay, RL, & Saks jewelry//Ray ban sunglasses. you're both adorable! love these colors! great job! Hope you'll take a look at my new blog and maybe follow it! Come and check it out and leave your impressions ! I love both of your look. Very nice color combination. Come and visit my blog. I love the orange pants! You two both look amazing in warm bright colors!! I'm especially in love with the orange trousers...they're amazing! Loving the fun colors in your outfits! Amazing! You have a really nice blog, sure we can follow each other! Following you now, now it' s your turn! I love how you two are always dressing the same styles or trends but still manage to make them look so different. Great colors for the weekend. 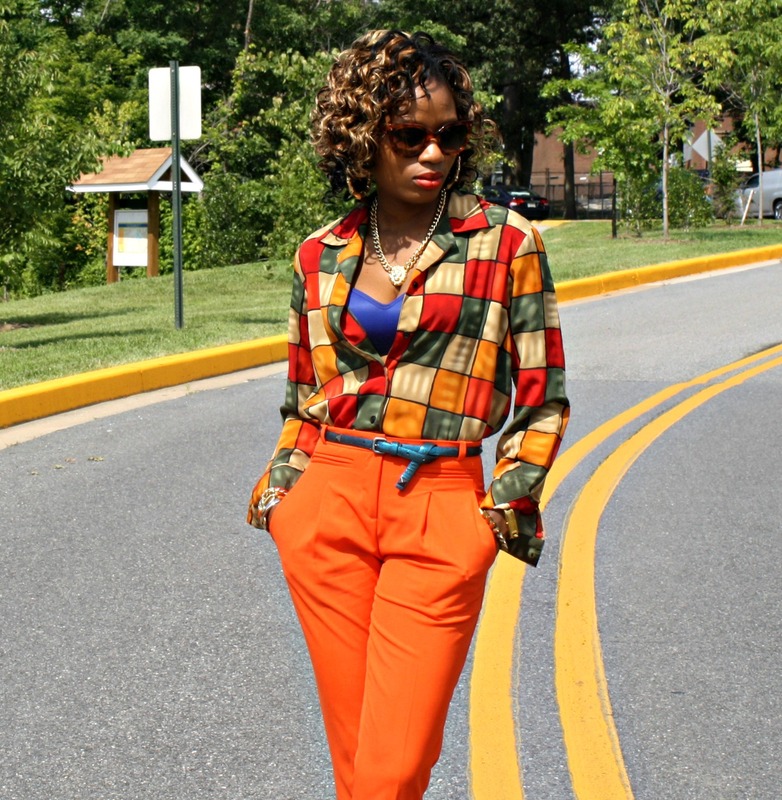 stunning orange pants...and love the teal shoes! beautiful combinations. Amazing colours! You both look incredible! Stunning look, great sense of style! LOVE IT!! Need I say more? 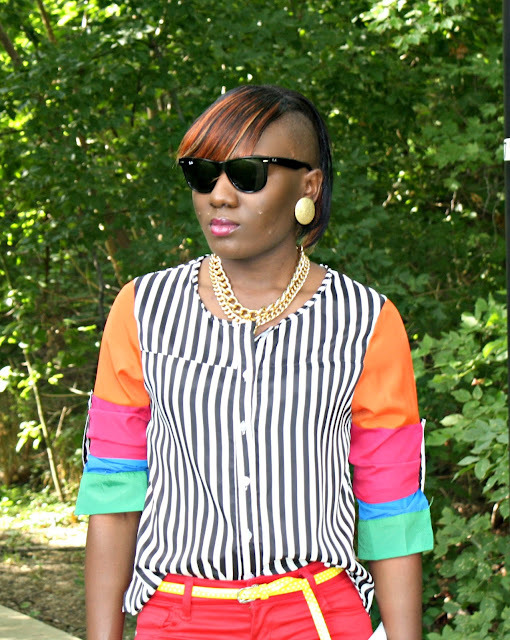 I love the way you combine different colors every time!!! These outfits make me smile! 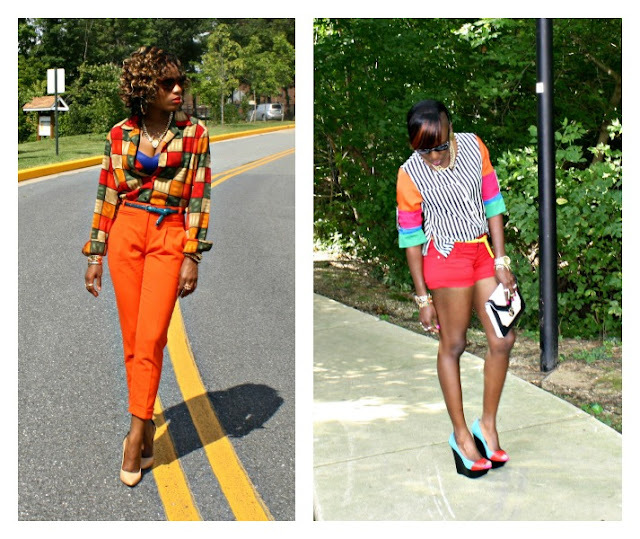 I love the use of bold colors and prints :) Beautiful, refreshing takes on color blocking and print mixing. love your mix of prints! and colors! wow these outfits are amazing!! im loving all the colours!! Hey :) thanks for your sweet comment and following me! I am now your follower as well! Amazing colours:) Love your style! The colors makes me smile :-) love it! Hi sweetie :) i love your blog is cool so i'm following you with GFC, visit my blog and follow me too if you like ;) i also have Twitter, facebook and bloglovin account , if you follow me i'll follow you back there too. thank you so much, it really made my day :)!! Of course I follow u ! You two look fabulous! I love all the colors! I love the colour combination! !, i follow you now :), kisses! Such great and colorful outfits! Especially love the wedges! Colours suit you so well, they look amazing together! Love the orange pants, and the shoes on the second outfit! i love your colours! the orange pants and the red shorts are great! Lovely saturday wish you ! Very colourful. Love the carrot colour pants! I love color and those are some awesome orange pants!! Pretty! Loving the bright colours. got some really nice color blocking there!! Following you now, hope you do the same! Always unique and colourful style from both of you. I like this so so much. Keep it up!!! I love this combination ..
shirt and trousers - delightfully stylish look! shorts and a shirt ... very cool band and a red color is so beautiful! I love how you ladies aren't afraid of experimenting with bold colors and patterns! you both look fab - but you always do! Amazing mixes of colours! I really like the both outfits and the wedges are so pretty! wow!!!! amazing colours!!!!! you look so so great!!!!! loving the burst of colours on u girls ! You both look amazing when dressed in vibrant colors! !